Shake up your prints this summer by mixing in tribal prints. Tribal prints are everywhere this season from high end designers like Mara Hoffman to lower end stores like Zara. You can work in tribal prints within your work week wear by picking out neutral tones while adding pops of colors for your weekend looks. If you work in a carefree environment, work in a tribal print skirt into your week wear. For a easy pairing pick a tribal print skirt that is more neutral then bold and vibrant. Picking a neutral tribal print skirt not only makes it easy to dress up, but it also isn't overwhelming in a work space. A simple blazer can really dress up a look, so pair your look up with a simple neutral blazer. Use pops of colors to keep your look from being to washed out. 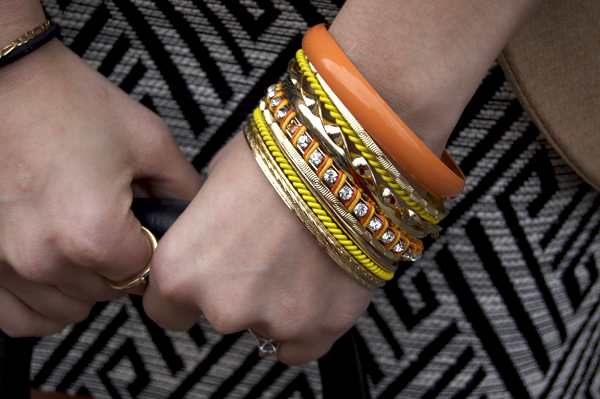 Play with colorful trenches or even colorful jewelry like the bangles. This look is also great to take from day to night. Slip off the blazer and slip on some high heels and red lipstick. Nothing says the weekend like a throw on and go outfit. A band tee can make any outfit weekend ready. Pair up your favorite band tee with a tribal print skirt and boots for the ultimate brunch look. Keep with pops of colors in your accessoires for boldness. How would you wear a tribal print skirt? awesome looks, love the shoes in both! love this mix! too cute! cant get enough of those red shoes! I love this so much! I feel so many people don't know how to re-wear their printed clothes twice during one week, this was helpful inspiration so thank! Cute looks! Loving your skirt and red coat! OMG I NEED BOTH PAIRS OF SHOES!